Really? Is that really your excuse for not adding some living color – literally, living color – to your home? Come on, having houseplants isn’t like doing brain surgery. And, if you do mess up with a houseplant, you can always get another one. Another brain? Not so sure about that. But specifically, let’s talk paperwhites, aka Narcissus tazetta (I had to google that, don’t be too impressed). Houseplants? Not really. They’re actually bulbs, and the bright, papery-white mini daffodil-shaped flowers will eventually die, the green leaves will fade. Rather than label them houseplants, let’s call them temporary residents, instead. You see paperwhite bulbs for sale beginning any time after Thanksgiving and into January or so. Why? It’s just the right time of year to force these bulbs into bloom. 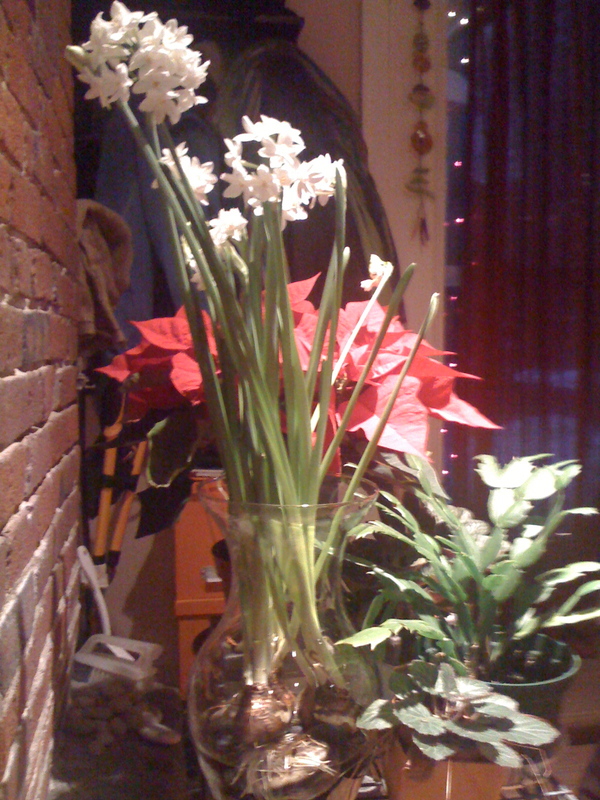 Forced early in December, the bright white flowers go well with the Christmas holiday decor. Set against the red of a poinsettia, and the white makes the red look even more Christmassy. They make a good pair. 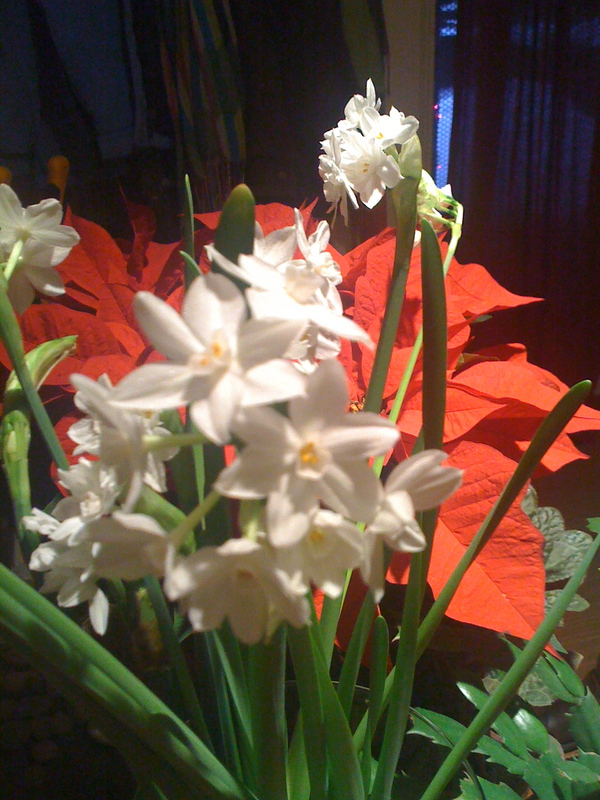 Paperwhites really do make the color of poinsettias pop. Wait – I think I have to define a word here, “force,” just in case you don’t catch my meaning. You’re not actually using force (or anger or intimidation) to make these bulbs pop their buds. To “force” means to … encourage, yeah, that’s it … you’re encouraging these bulbs to produce leaves and flowers for you at a time when Mother Nature would dictate they sleep for the winter instead. Begin forcing paperwhites in mid December, and they’ll bring you a whole different experience. At least for me. As you’re dismantling your tree, taking down the decorations and removing all hints of the Christmas holiday round about New Year’s Day, the paperwhites are pushing out their petals. The house is not suddenly stale and cold. There’s life in full flower on the windowsill. Plant up some paperwhites every weekend from mid December through mid January or whenever your bulb supply runs out, and the narcissus blooms should take you right up until Valentine’s Day, when a color of another sort may appear if you’re lucky. You don’t have to plant your paperwhites as I do. 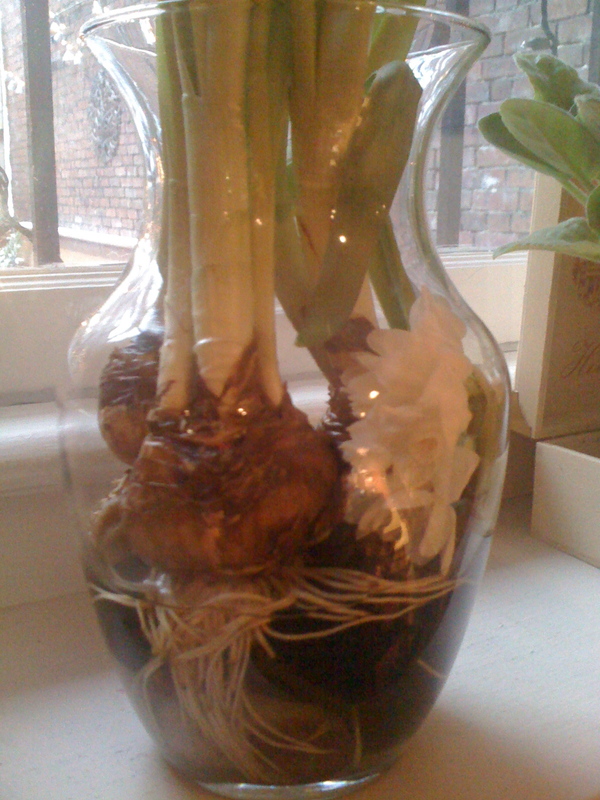 This technique – potting up the bulbs in water – works for me. And is a lot easier to clean up than potting the bulbs in potting soil. three paperwhite bulbs – I found mine at Mahoney’s Garden Center in Brighton. -I use any sort of clear-glass vessel I can find that has a) an opening big enough for me to squeeze my hand through and b) is at least 6 inches deep. An 11-in. tall vase – the standard kind you get with a nice bouquet delivery – is ideal and I’ll tell you why later. An 8-in. vase is a tad too short. Explanation to come below. -Place stones/glass/whatever in the bottom of the vessel to create a layer at least 2 or 3 inches deep. -Place each paperwhite bulb on top of the stones, nudging them in just a bit. Don’t bury the bulbs, just make sure they are securely on the stones. Bulbs can touch, don’t worry. Oh, and place the bulbs GREEN SIDE UP! Your bulbs should have a visible root side and emerging green stemmy-looking side. If you put the green side down, god help you son. -Place on a windowsill or somewhere they can get some light – they are plants, after all. -Add water to the vase to just about the bottom of the bulb. 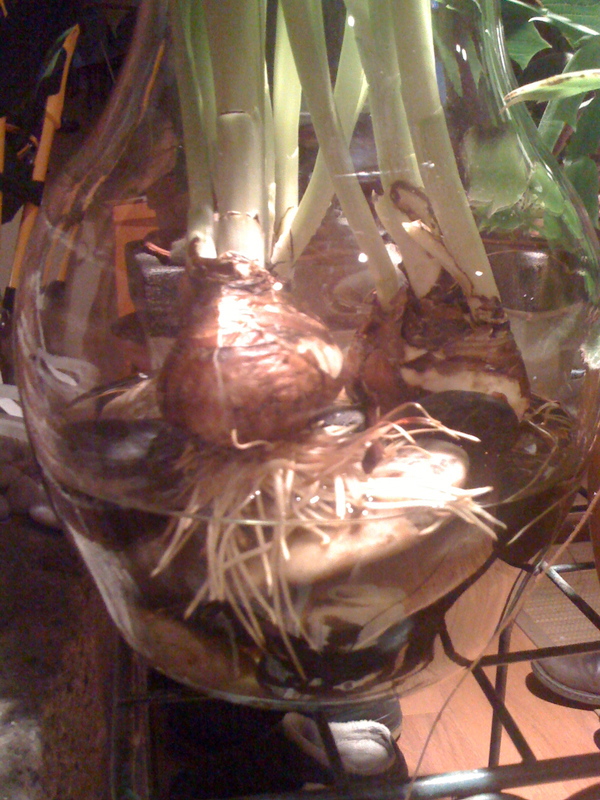 The bulbs can sit in a bit of water, but don’t flood them. Even the paperwhite roots are cool to see. Looks like I need to add some water to the vase! Got a cat or dog? Adding water to their water bowl? Well, check if your pet paperwhites need water, too. It may take a week or so to see some activity. You’ll see it first in the water – brownish white roots will emerge from the bulb. That’s a good sign. Once that happens, the top will start elongating and long leaves will grow by leaps and bounds each day. And eventually a stalk will pop out of the bulb with a thin membrane-encased bunch of baby flowers. Ah, birth! So, the explanation for why I prefer an 11-in. vase. Simple. These leaves and flowering stalks get pretty tall. The shorter the vase, the more easily the tall stuff slumps over. My paperwhites in the taller vase don’t even think of slumping. Looks much neater. However, if you like the paperwhites-gone-wild look, go for it. A tall vase helps keep the stems and leaves stand straight. -One BIG bummer I experienced last year was a batch of bad bulbs. Not sure what happened to them, but they didn’t emerge more than an inch or two, and they never did flower. -You can add too much water and your bulbs will get icky. Icky as in moldy and soft. -You can have too many bulbs in too shallow a container. And your top-heavy flowers will tip over. Is it apparent I’m speaking from experience? -Not that this is too horrible of a problem but … check out this photo. The emerging leaves and stems couldn’t quite make it up and around the curve of the vase. They had nowhere to go but where they were. So, I ended up with flowers inside the vase. Actually, it looks pretty interesting to me. These paperwhite flowers couldn't quite make it out of the vase. Oh, one thing you may want to be aware of: Paperwhites have that same effect on people as cilantro – you know, where people either like the taste of cilantro or think it tastes like soap. The paperwhite fragrance is kinda/sorta the same way, except it’s not soap it will smell like. But don’t let this dissuade your trying paperwhites. It was my duty to tell you. Hi Ellen- I forced a few batches of paperwhites last year for Christmas gifts and they were loved by all. – one tip- my mother told me (so you know it’s true) to add a teaspoon to tablespoon of Gin (yes from the liquor store) to the water depending on how much water you are using to keep the shoots from growing too long and flopping over. They will still flower just as well, they just won’t be as long. You know, I just heard about that liquor addition while searching #paperwhites on Twitter this morning. The item I read said vodka. Hmm… Talk about buying Narcissus a drink! You are currently reading Paperwhites: Fresh Color For the New Year at The Dainty Dot.